NonCommissioned Officer Sword with CSA Embossed on Guard. Has a flexible scabbard that is slighly bent. The sword does fit into the scabbard. This sword is a handome replica of a Civil War era Non-commissioned officer's sword. It has an overall length of 40 inches and a blade length of 33 inches. 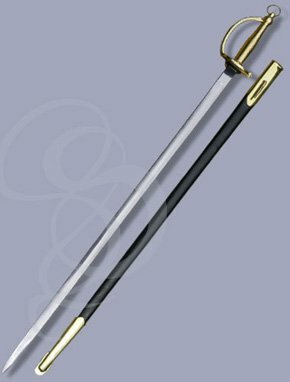 The sword features an authentic carbon steel blade as well as a brass handle and guard. The guard and grip boast wonderful detail available with and without the letters CSA(Confederate States of Americal) embossed into the guard. The sword comes with a leather wrapped wood scabbard with brass fittings. This sword is a great choice for collectors or for cival war reenactment.